The Abbott & Costello Show - The Complete Series Collector's Edition (1952) goes on sale on March 30th. The 9 DVD set of the complete series has recently had a price drop on Amazon from $59.98 to $38.99. This is an amazing price for the re-mastered complete set of the great TV series and is a must have for any Bud and Lou fan. It can be pre-ordered today. The Abbott and Costello Show, a half-hour television sitcom starring the popular comedy team of Bud Abbott and Lou Costello that premiered in syndication in the fall of 1952 and ran until the spring of 1954. It is regarded among the most influential comedy programs in history. In 1998Entertainment Weekly praised the series as one of the "100 Greatest TV Shows of All Time." In 2007, Time magazine selected it as one of the "The 100 Best TV Shows of All-TIME." The show was a vehicle to bring the duo's tried and true burlesque routines to television in a format that the team could control. There were none of the musical interludes or love stories that marred most of their feature films. Basically, if a situation or gag was funny, they filmed it without regard to plot, character or continuity. As a result, the show became a valuable record of classic burlesque scenes performed by one of the greatest comedy teams to come out of burlesque. 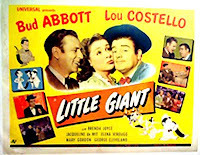 The supporting cast included Sidney Fields as their landlord; Hillary Brooke as a neighbor and sometime love interest; Gordon Jones as Mike the Cop, a dimwitted foil for the boys; Joe Besser as Stinky, a 40-year-old man dressed in a Little Lord Fauntleroy suit; and Joe Kirk (Costello's brother-in-law) as Mr. Bacciagalupe, an Italian immigrant caricature who held a variety of jobs depending upon the requirements of the script. Several episodes featured a pet chimp named "Bingo", who was dressed exactly the same as Costello. Bingo, who was a female chimp, was fired from the show after biting Costello. Brooke, Besser, and Kirk also left the cast after the first season. A handwritten copy of D.D. Beauchamp's manuscript for "Abbott and Costelo Go to Mars" is on sale for $4500.00 from Royal Books. The Royal Books website describes the manuscript as " Present in its entirety is Beachamp's original treatment, executed in pencil, with holograph corrections. Interspersed throughout are the resulting typewritten pages (also with holograph corrections). The combined pages are bradbound with green studio covers, showing a date of December 5, 1951 (two years prior to the film's release, and well before production began)". Although "Abbott and Costello Go To Mars" is one of my favorite A and C movies I do don't see myself spending $4500 for this manuscript. But I'm sure someone will! You can find more info on the mamuscript at the link below. On Friday February 26th at 8pm the Bay Street Theatre is showing Abbott and Costello's "The Time of their Lives". Tickets are $5 each - unless otherwise noted - and can be purchased one half hour prior to the movie. Doors open at 7:30 pm - movies start at 8:00 pm. The BAY STREET THEATRE is a not-for-profit 299-seat professional regional theatre situated on Long Wharf, in Sag Harbor, NY, and founded in 1991 by Sybil Christopher, Stephen Hamilton and Emma Walton.